The final day of London Fashion Week featured more floral and more minimalism. 70s silhouettes, 90s influences and a few other things I am still unclear on. 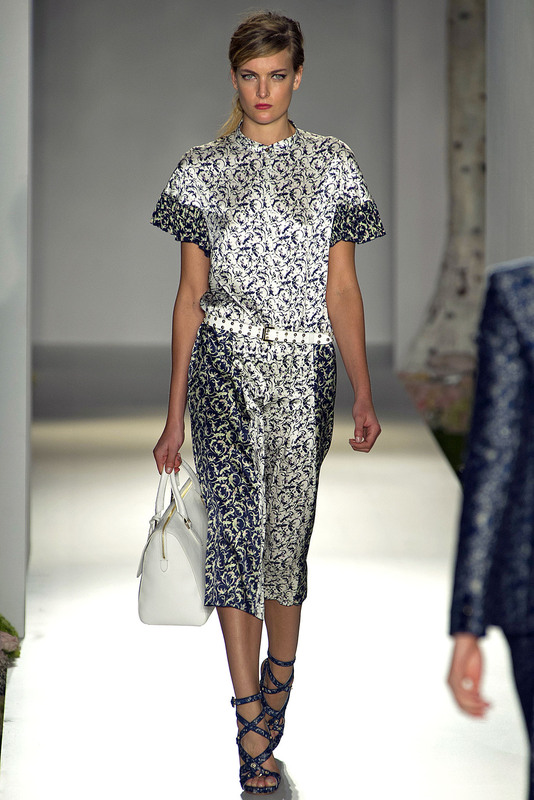 Read on to see what Mulberry, Simone Rocha and Fashion Fringe featured for Spring 2013. Mulberry, the British brand, and one of my personal favorites, showcased a chic array of sorbet hues, leather and boxy outerwear for Spring 2013. Mulberry also featured a lot of floral on floral on floral. Seen in abundance on the handbags. Another trend that has slowly been resurfacing and was spotted over 3 times on the Mulberry runway was the halter dress. The halters were small and reminiscent of the halter dresses from the 90s that people wore to Prom, but I didn’t hate them as much this time around. I guess there is a time and place for everything, and this spring halters are happening. White reigned supreme at Simone Rocha. So did eyelet. The clean lines were reminiscent of the scene at New York, but there was also a feminine element with the dainty collars scalloped skirts. There were also masculine undertones with the boxy bodices and loafer-esque shoes. Fashion Fringe was unlike most shows seen on the runways. Unlike the clean lines and minimalism that has dominated the fashion scene so far, Fashion Fringe showcased structured shoulders, draped dresses and warrior-esque hats. Print mixing was also a factor at fashion fringe, one trend that has been seen all over both fashion weeks. And just like that, London Fashion Week has come to a close and it’s on to the next Fashion Week and I can’t wait to see what the Milan runway’s have in store.